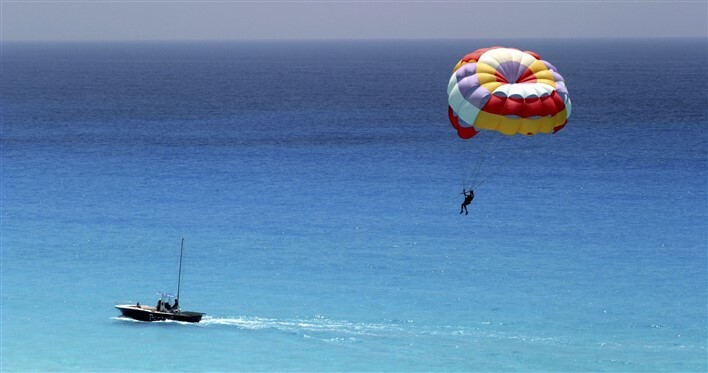 Parasailing is an exhilarating aero adventure sport organized in different places of Bangalore. The word is originates from ‘para’ of parachute. The rider, or parasailer, is usually suspended from a parachute which is attached to fast moving vehicle. There are two kinds of parasailing, i.e. Terrestrial and Aquatic. Terrestrial Parasailing: In this version, the parasail is attached to speeding cars, usually sports cars, so as to enable maximum speed to allow the parasailer float at greater heights. Aquatic Parasailing: In aquatic parasailing, the parasail would be attached to a speed boat which is controlled by helpers, who alter the speed to enable the rider float in the parachute in an elevated distance. Aquatic parasailing is not possible in Bangalore as there are no water bodies fit for this activity. However, Terrestrial parasailing is organised in the city throughout the year with exception of the monsoon season. A parasail works on the same principles as kites, the only difference is that a person is attached to the other end of the string instead of a kite. Once the parasailer is harnessed and ready to take off, the driver of the vehicle takes control. The passenger can just sit back, relax and enjoy the ride from a higher to lower altitude. The rider touches down on earth or water towards the end of the ride to maximise the thrill of this sport. Is Parasailing A Safe Sport? Experts consider this sport as the safest aero adventure sport. The take-off and landing are controlled by the experienced controller. Hence, one doesn’t need any formal training on how to expertise it. Nevertheless, precautions have been taken to ensure the safety and security of prospective riders for an adrenaline-pumping adventure. Just like any other adventure sport, it is certainly not for the weak hearted, and anyone else with an unstable physical or mental condition. However, parasailing can surely help one get over their phobia of heights!